UX research, UX design, stakeholder meetings & presentations, handoff with visual design and devs. In previous years, the web and app redesigns were driven primarily by analytics, company politics and a “if it’s not broke, don’t fix it” philosophy. These things are all important, of course, but it became more and more apparent that obtaining firsthand knowledge of a customer's experience was critical. In addition, mobile app usage is low, actually very low, with less than 3% of fairgoers using it. So for 2019, we would lift the lid, question assumptions and most importantly, talk with the users! People want more information about events, rides and food. People don’t and won’t always categorize things the way that we do. People often looked for something in one category, when the item they were looking for was in another. Long lists of information are unruly and lead to users bouncing. App Download and benefits should be front and center. Map doesn’t work well on mobile web. 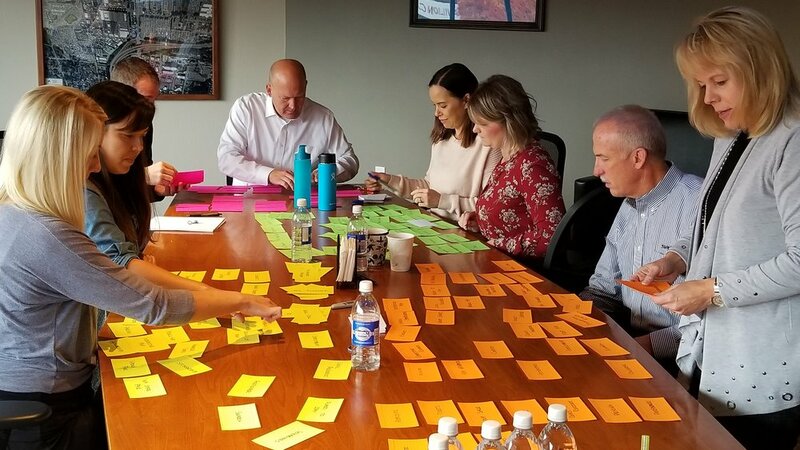 Visualizing user attitudes and behaviors in an empathy map helps teams align on a deep understanding of end users. 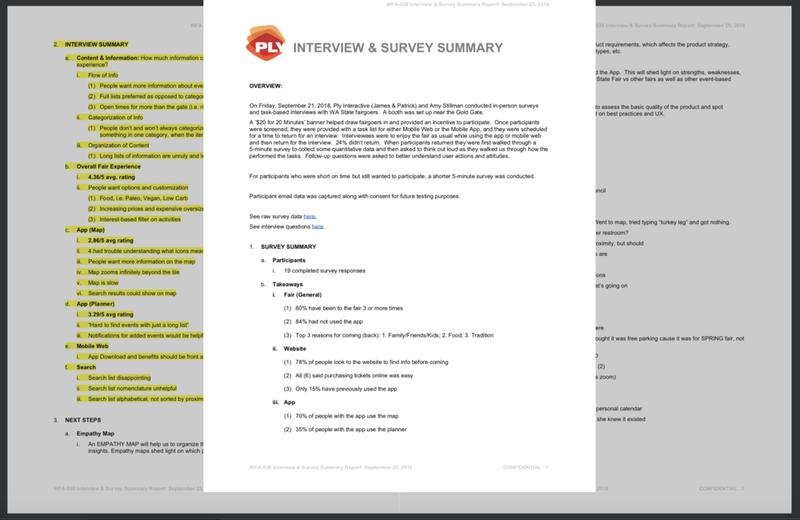 Personas were already in place so we updated them and focused them to include real-world user goals and concerns. A content audit is a qualitative analysis of all the online content. It exposes where your content actually lives, how it’s performing, and where the thematic gaps are. Before I could audit the content, I created a Content Inventory, a comprehensive list of the name, location, and description of each asset published by The Fair. Later, I’ll use the data from this audit to help build the sitemap! We look at heuristics to assess the basic quality of the product and spot potential opportunities for improvement. 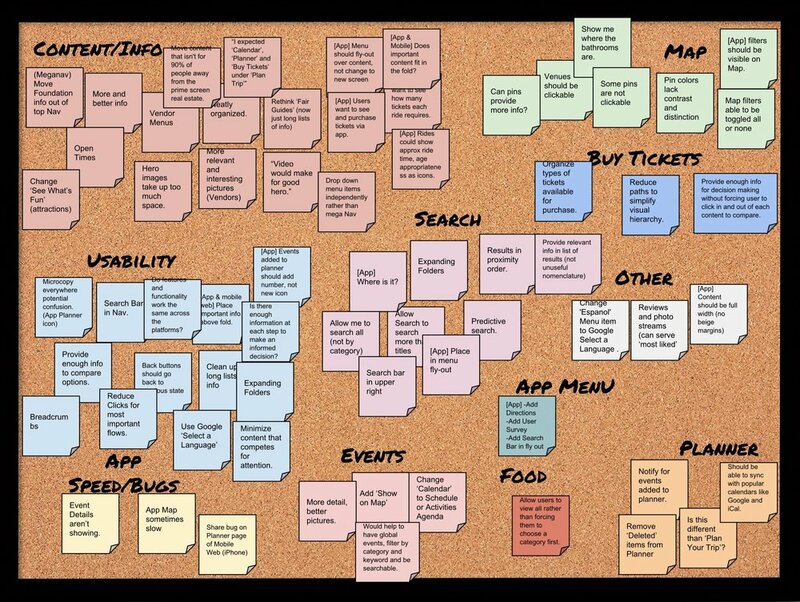 How does a user experience the product from beginning to end? Menus are confusing and busy. 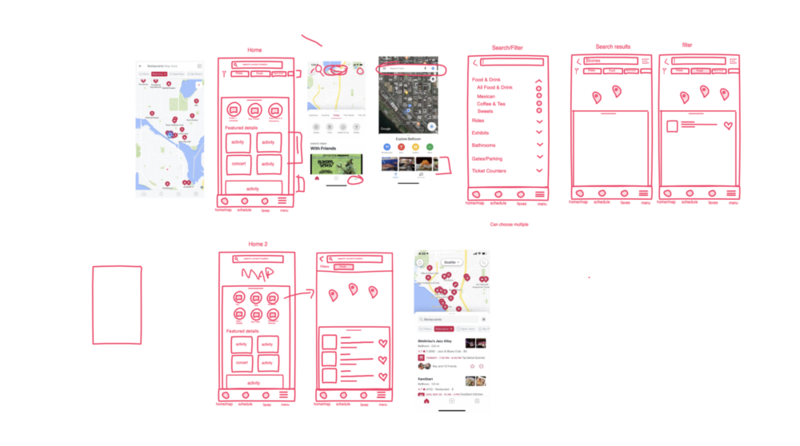 A UX competitor assessment involves assessing competitor apps and websites to see how they design for their users—potentially solving for similar user needs. A decent analysis help us gain an objective overview rather than get fixated on specific features. We first get clear on the issues WA Fair site and app have (previous phase) and the problems we're looking to solve (user research). Then, we go to the competitors to understand how they have tackled these problems and can assess how well their solutions would help your users. Drop down the menu items independently. Improve filtering and pin color contrast. Add more info when user clicks on pin. Display events with MORE info and better pictures in a visual concise and interesting way. Would help to have global events, filter by category and keyword and be searchable. Hero takes up too much space, often irrelevant and no CTA. Tag content or allow search to see more than titles. Provide relevant info in list of results (not unuseful nomenclature referring to gates and addresses. Reach - how many customers will this project impact over the year? 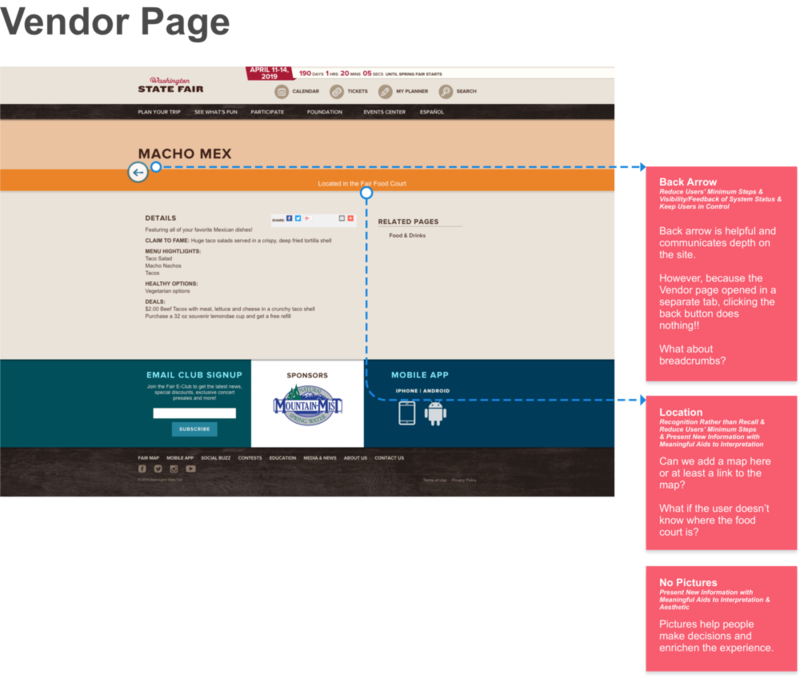 Impact - how much will this project increase conversion rate when a customer encounters it? Confidence - how strong is the supporting evidence? Effort - how much time will this take? 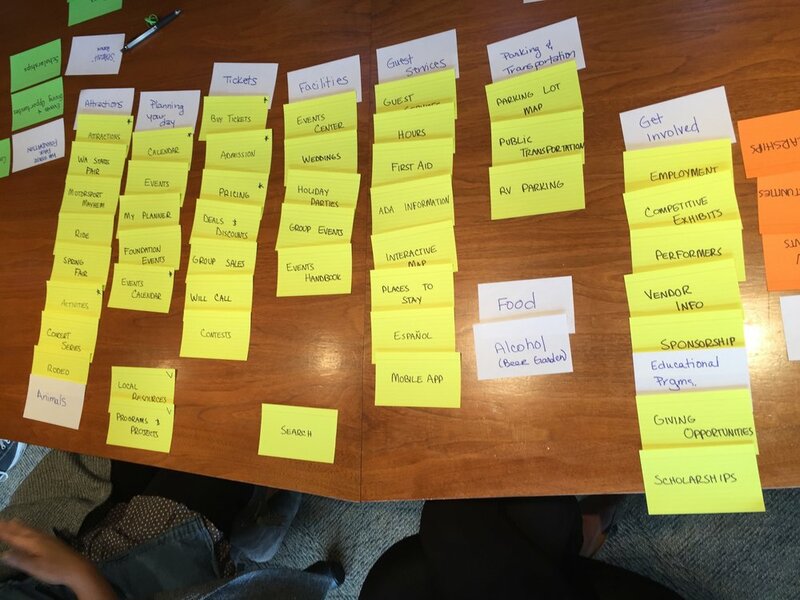 Card sorting is a method used to help design or evaluate the information architecture of a site. They help make site content discoverable and easy to find. Tree testing tells you how easily people can find information on your website, and exactly where people get lost. The card sorts told us how people think the content should be grouped and labeled. 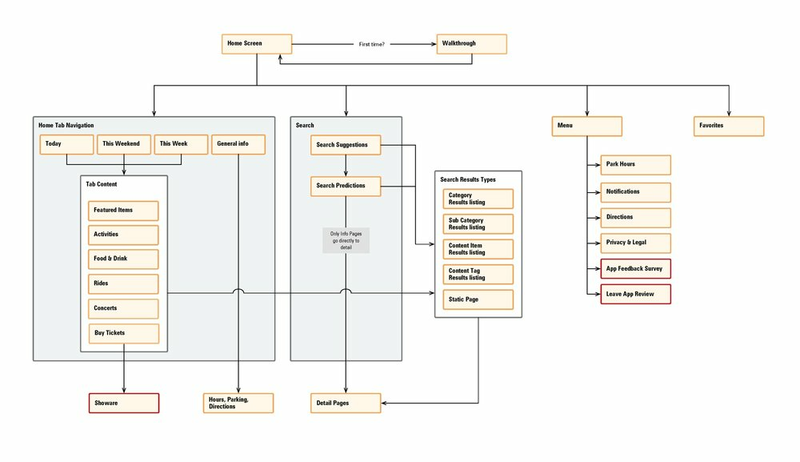 I created a draft sitemap based on the results of the card sort and site requirements, and I run a tree test to see how it performs based on common user tasks. I recruited participants by sending an incentivized email to The Fair’s newsletter subscribers. Participants were given tasks and presented with a text-based hierarchy. Upon completion, I reviewed success rate, error-free rate and time to completion. For instance, is Performers for those performing or those who want to see them perform? Most thought Deals & Discounts should live under or be integrated with Tickets. 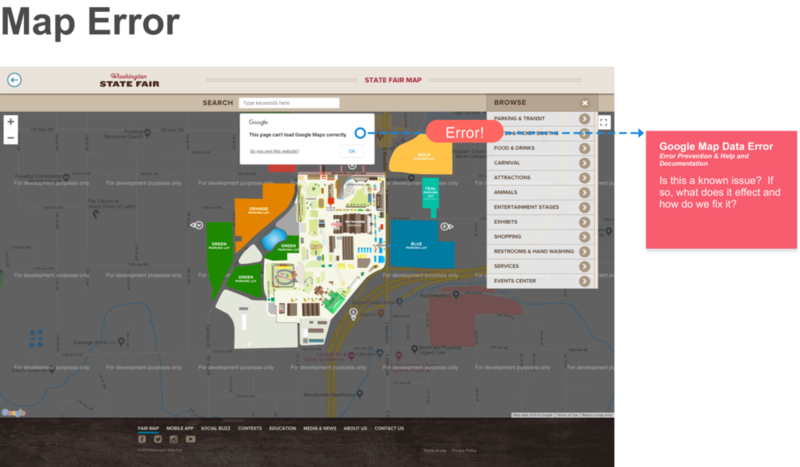 Interactive Map and Schedule are seen as App features to be downgraded in importance on the web. People have very different ideas about where to find things. Adding multiple paths helps, but is messy and overwhelming. Build systems that can be accessed using user’s vocab and teach grouping along the way. In addition to a new website and app, we moved all of the data from a proprietary CMS over to Dato for a better Fair Admin user experience. 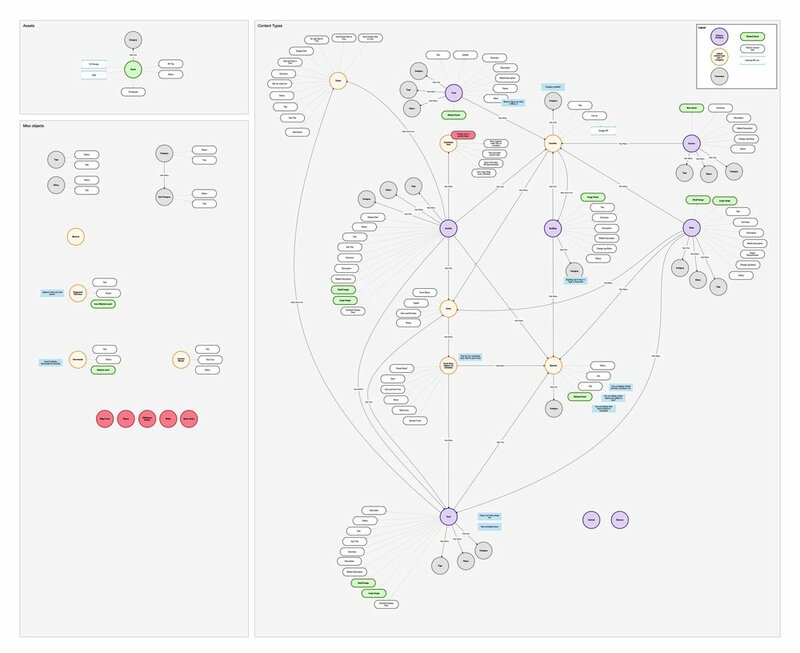 This diagram went through numerous iterations, nearly daily, as we wrestled with the connections between one thing and the next. The fair has a tremendous amount of information and until now much of that information was duplicated and disconnected. I like to start with whiteboard or Invision Freehand before any project. It allows for quick ideation, exploration and creativity. Starting with boxes helps identify recurring elements and also helps inform the design in a developer friendly way. 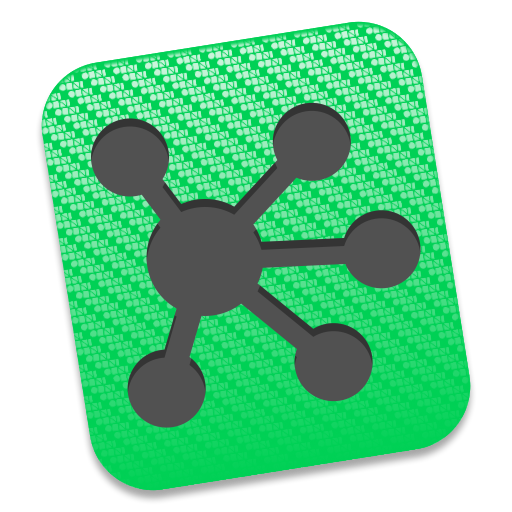 Over several days, I fleshed out every conceivable action within the app. 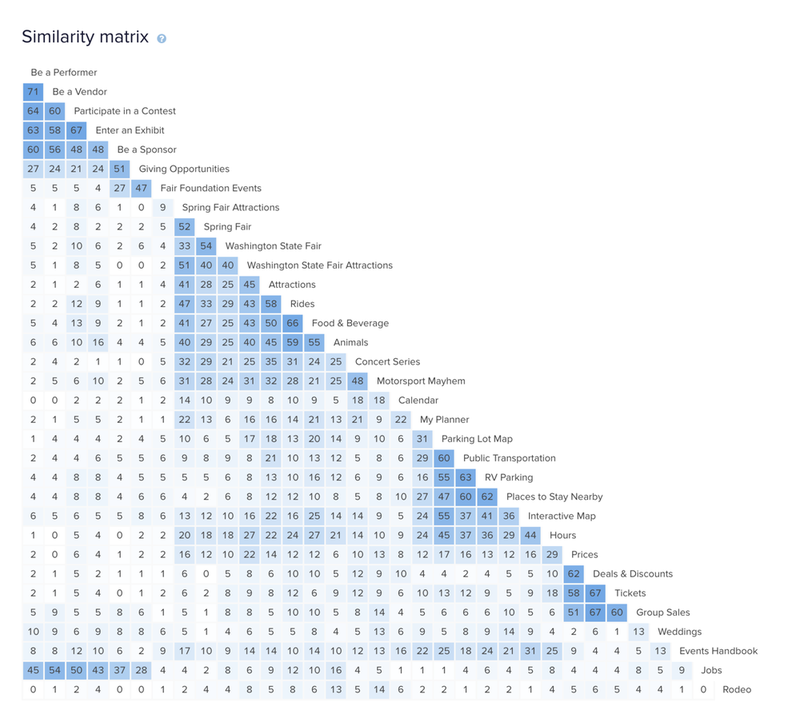 One of the main elements is a drastically improved and highly complex Search, which required explicit rules to get just right. 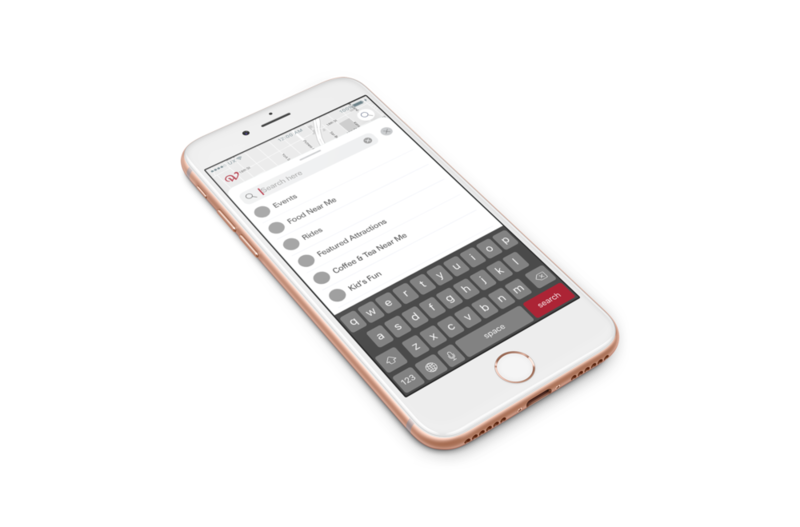 I ran through several app flows and iterated to make things as simple and cohesive as possible. 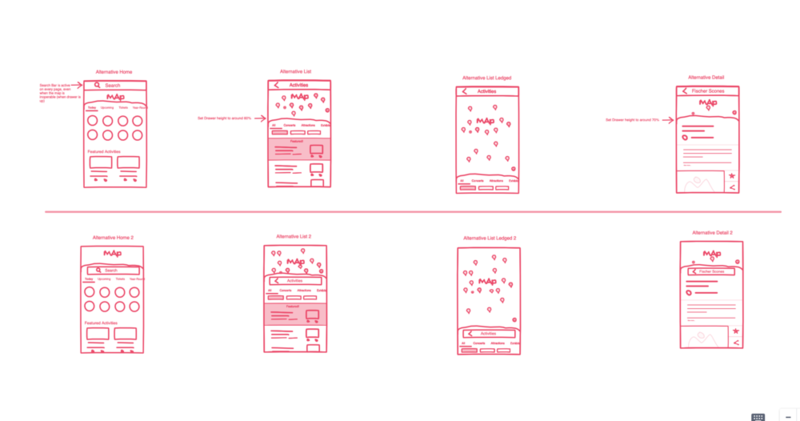 After each iteration to the wireframes, user testes were performed to identify issues. What a great project! 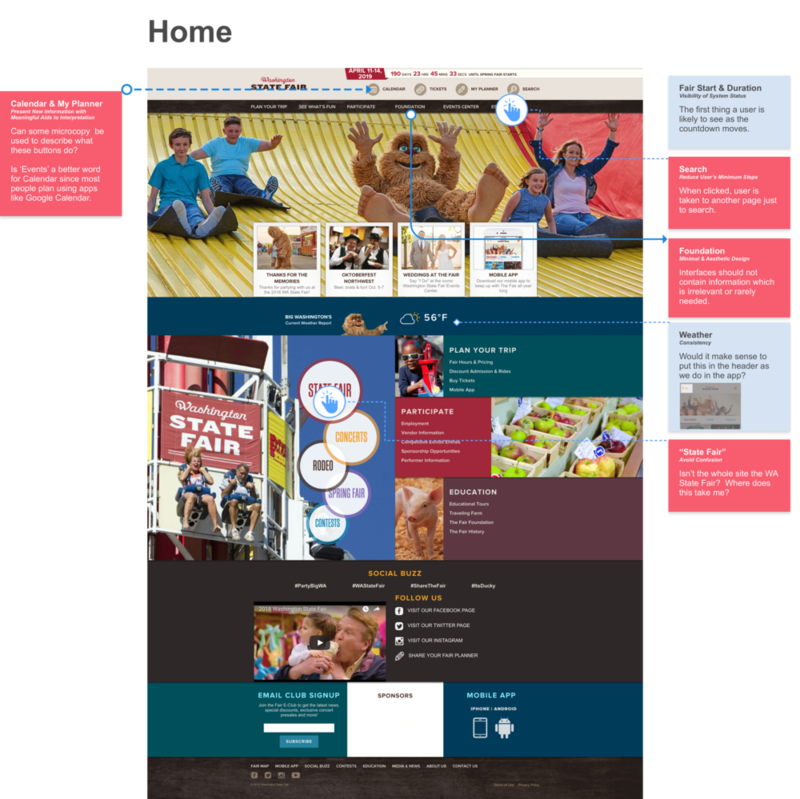 The Fair’s tremendous amount of information required a complete overhaul to their data/CMS as well as the information architecture. I introduced a new way of interacting with the app that created a more exploratory and enjoyable experience.